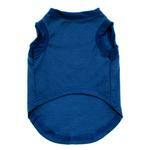 Our Plain Dog Shirt in Blue will have your dog looking fabulous in this versatile shirt. 65% cotton, 35% polyester blend. Stand out among all the other dogs! 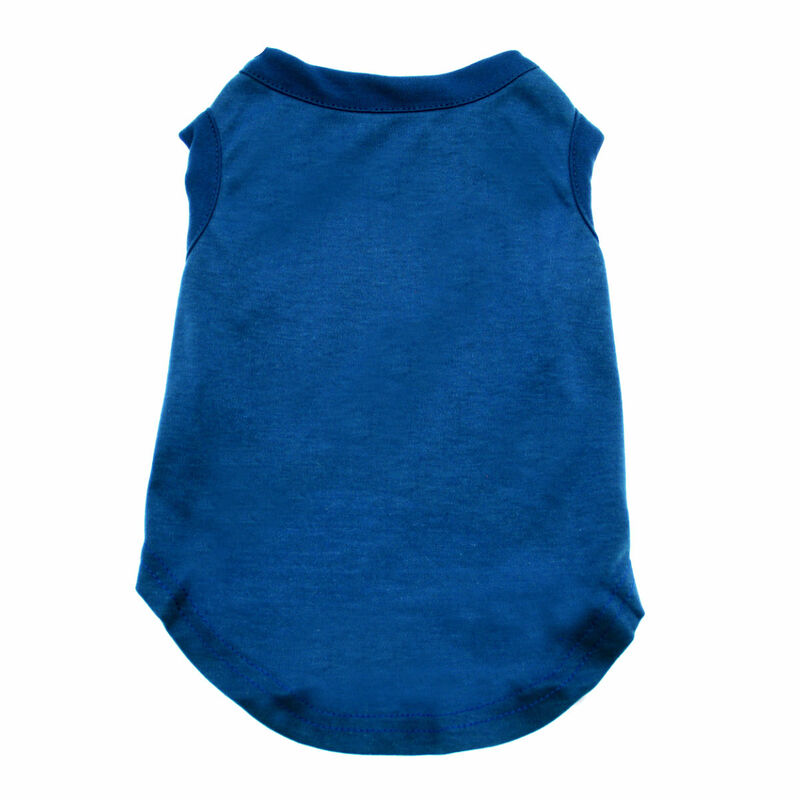 The Plain Dog Shirt in Blue is a cool, comfy design for a perfect look year-round. Plus, the lovely hue look makes quite a fashion statement! This sleeveless dog shirt is great on its own or can be the foundation of an entire outfit. Add a skirt, a scrunchie or tutu for a look that's your pup's alone. These shirts are also great for layering for extra warmth. This blue dog shirt is appropriate for any patriotic event. For even more fun, add iron-on patches, embroidery, or screen printing to commemorate an event or just for cuteness. Have the dog help your event be even more special by designing these tanks for graduation parties, announcements, birthdays, or sports teams. You could also customize these for a charity or pet event. The sky is the limit! 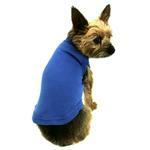 We also like these tanks to help with recovery from surgery or to protect skin from scratching and biting. Keep several on hand for your recuperating pet. Great for personalizing or screen printing on your own. Classic and simple style for your dog! Made with a 65% cotton 35% polyester blend. This shirt by Mirage runs small compared to many of our other brands. Always measure your pet and allow for extra room for a heavy coat and for movement! Plain Dog Shirt - Blue Customer Photos - Send us your photo! Charming is wearing his brand new tee-shirt and bowtie from BaxterBoo! He loves to run around and steal hearts all day - And he can't do that without looking his best! He loves to cuddle while Mommy when he isn't running around being the little Charmer that he always is! Angus is the pug (being held by the "Evil Queen") in the blue shirt! He was "Sneezy" for Pug o'Ween this year. This "Snow White and the Seven Pug Dwarves" ensemble won Grand Prize at Pug Pals' Pug o'ween event in Boise, Idaho. Each pug wore one of the Baxter Boo t-shirts. We made hats and put each pug-dwarf's name on back of the shirt (with a sticky label, so the shirt could be worn again and again). These shirts worked SO WELL for this costume! Perfect! Posted On 10/11/17 by Roxann M from Reading, PA Yes, Roxann M recommends this product! These t-shirts fit my Chinese Crested Sookie so perfectly. They are perfect for cooler days to help keep her warm and comfortable. Posted On 03/22/17 by Zoe B from , TX Yes, Zoe B recommends this product! Llike the fabric. it's almost a heather blue, reminds me of denim. Fit like it was supposed to. Posted On 02/28/17 by Derik W from Alexandria , LA Yes, Derik W recommends this product! My Jack Russell Terrier loves to wear clothes! When I buy him a new outfit, he eagerly sticks his head through the opening & his paws through the arm holes . This one is great for comfortable weather. Not too thick to make him hot indoors. And just like a regular T-shirt, this one will get softer and more comfortable after several washings. Posted On 12/08/15 by Sonia L from Los Angeles, CA Yes, Sonia L recommends this product! I bought this plain blue dog shirt in a size large for my 11 pound miniature pinscher. These do run small as she is normally a size medium. It fits perfectly though and it is really good quality. It is a thicker shirt. I love it and would definitely recommend! Posted On 11/13/15 by Phyllis W from Philadelphia, PA Yes, Phyllis W recommends this product! Posted On 10/20/15 by Phyllis W from Philadelphia, PA Yes, Phyllis W recommends this product! Posted On 10/15/14 by christy b from nyc, NY Yes, christy b recommends this product! 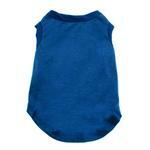 Handsome blue t-shirt for that dog in your life! Nice quality! Posted On 11/08/13 by Laurel from Boise, ID Yes, Laurel recommends this product! We purchased 9 of these shirts recently. Seven were used for our ensemble Pug o'Ween costume, "Snow White and the Seven Pug-Dwarves." We WON the Grand Prize! Each shirt fit the pugs perfectly, and you might know how difficult it is to fit the BC (broad chested) dog! These are nicely stretchy, and the colors are beautiful. Each of our seven pugs wore a different color and we made hats in nearly-matching colors. If you are looking for a nice quality, low cost t-shirt that your dog will stay in even though she or he normally doesn't like to wear dog clothes, this t-shirt might just be for you!